Interesting event this week at UC Berkeley. Details below. 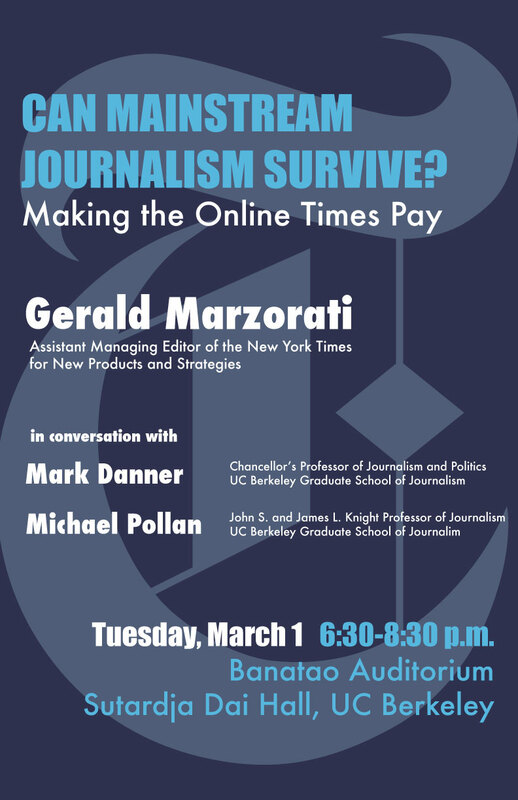 The Graduate School of Journalism is pleased to announced that Gerald Marzorati, Assistant Managing Editor of The New York Times for New Products and Strategies will be on UC Berkeley's campus, Tuesday March 1 6:30 – 8:30pm at the Banatao Auditorium in Sutardja Dai Hall. Mr. Marzorati will be discussing plans to monetize the Times' new media platforms in the coming months. He will be joined on-stage by Mark Danner, Chancellor's Professor for Journalism and Politics & Michael Pollan, Knight Professor of Science and Environmental Journalism at the Graduate School of Journalism, UC Berkeley.